Democrats won all statewide offices this cycle, with J.B. Pritzker leading the ticket and defeating incumbent Bruce Rauner. Kwame Raoul won the race for Attorney General, replacing Lisa Madigan who did not run for re-election. Jesse White, Michael Frerichs, and Susana Mendoza all won re-election for their offices. Democrats were able to pick up seats in both chambers, but a number of legislators did not run for re-election. In the Senate, eight legislators did not run for re-election. Some retired, while others ran for higher office. Four legislators lost their re-election bid, either in the primary or in the general. Additionally, Kwame Raoul was not up for re-election, but was elected as Attorney General, so he has resigned his seat and his replacement has been appointed. That makes a total of thirteen new senators of a total of fifty-nine. Democrats picked up a total of three seats and control the Senate with forty Democrats compared to nineteen Republicans. The House will also have a lot of new faces in 2019. Twenty-three members did not seek re-election. Eight members lost their re-election bid, either in the primary or in the general. Additionally, two members that won re-election have resigned. In total, there are thirty-three new representatives. Democrats picked up a net of seven seats and control the House with seventy-four Democrats compared to forty-four Republicans. The General Assembly passed the Fiscal Year 2019 budget which became Public Act 100-0586 (HB 109), meeting the traditional May 31 deadline this year for the first time since 2014, and with overwhelming majorities. The Senate passed it on a vote of 56-2-0 and the House on a vote of 97-18-0. The Governor signed the bill into law on June 4. The budget sets Illinois’ operating budget at $38.5 billion which is an increase of $600 million from the current year. There is an increase of $350 million in k-12 education as a result of the education funding formula reform passed last year. Last year, the budget reduced municipalities’ portion of the income tax by 10%. This year, they will only see a reduction of 5%. Additionally, last year the State imposed a 2% collection fee on the local sales taxes that the Department of Revenue collected. This budget reduces the fee to 1.5%. These two changes are estimated to result in an additional $120 million going back to local governments. The budget also relies on $445 million from three pension changes. The most significant change would allow a Tier I member to cash out a portion of their COLA when they retire. They would receive a distribution at retirement equal to 70% of the present value of the difference between their 3% COLA and the new lower COLA. Instead of receiving a 3% compounded COLA starting a year after retirement, they would receive a COLA equal to 1½% simple interest once they turn 65. Missouri had a similar program and 22% of retirees accepted the buyout. As of this writing, this provision has not been implemented. Once again, the budget relies on $300 million from the sale of the Thompson Center in Chicago. However, it has been announced that a sale will not happen this fiscal year. The bill extends the for-profit hospital income tax credit (which is equal to property taxes paid or charity care provided) through the 2022 tax year. The bill creates a new adoption income tax credit for parents that adopt a child during the tax year. The bill expands the definition of a retailer maintaining a place of business in this State under the Use Tax Act. Beginning October 1, 2018, a retailer will have an Illinois presence for tax purposes and be required to collect Illinois’ 6.25% use tax if its cumulative gross receipts from sales of tangible personal property to Illinois purchasers exceed $100,000 or if the retailer enters into 200 or more separate transactions for the sale of tangible personal property to purchasers in Illinois. The bill extends the individual income tax credit for damage caused by a natural disaster for the 2018 tax year. Public Act 100-0629 (SB 3527), sponsored by Sen. Steve Stadelman and Rep. Jehan Gordon-Booth, creates the Historic Preservation Tax Credit Act which would allow a tax credit equal to 25% of the qualified expenditures on a project. The credit has an annual cap of $15 million and a maximum of $3 million per project. The credit will sunset after the 2023 tax year. Secondly, the bill makes some technical corrections to the river edge historical tax credit, including adding language allowing for the credit to be carried forward. Public Act 100-0686 (HB 5214), sponsored by Rep. Carol Sente and Sen. Elgie R. Sims, Jr., makes technical changes to the Angel Investment Credit. The bill allows credits that are allocated to minority-owned businesses, women-owned businesses, and businesses that are owned by a person with a disability to be awarded to other investors if not claimed within the first 3 quarters of the year. Additionally, applicants that own 51% or more of the business receiving the investment cannot receive a credit. Public Act 100-0698 (SB 405), sponsored by Sen. Toi W. Hutchinson and Rep. Sara Feigenholtz, requires taxpayers that claim an EDGE credit to file a report with DCEO that contains details of the taxpayer’s sexual harassment policy. DCEO will determine the form and manner of submitting the report. Public Act 100-0731 (SB 3212), sponsored by Sen. Melinda Bush and Rep. Ann M. Williams, allows county and city officials to share reports of damaged property to a township or county assessment official for the Natural Disaster Credit. Public Act 100-0865 (SB 1437), sponsored by Sen. Laura M. Murphy and Rep. Martin J. Moylan, extends the CPI increase to the individual income tax standard exemption through the 2023 tax year. Public Act 100-1014 (SB 2868), sponsored by Sen. Don Harmon and Rep. Elizabeth Hernandez, allows taxpayers to donate money to the Hunger Relief Fund when filing their income tax returns. Public Act 100-0594 (HB 4415), sponsored by Rep. Jerry Costello, II and Sen. Don Harmon, extends the coal and aggregate mining equipment sales tax exemption through July 1, 2023. Public Act 100-0940 (SB 3141), sponsored by Sen. Karen McConnaughay and Rep. Michael J. Zalewski, imposes a penalty on retailers that fail to keep books and records or produce them to the Department of Revenue for examination. The penalty is $1,000 for the first offense and $3,000 for subsequent offenses. Public Act 100-1167 (HB 4560), sponsored by Rep. Joe Sosnowski and Sen. Dave Syverson, allows non-home rule counties to use proceeds from a 1% sales tax for mental health and substance abuse purposes. Currently, the revenues can only be used for public safety, public facility, or transportation purposes. Public Act 100-0781 (SB 486), sponsored by Sen. Don Harmon and Rep. Barbara Flynn Currie, creates a uniform method for assessing solar farms for counties other than Cook. SB 2744, sponsored by Sen. Terry Link and Rep. Michael J. Zalewski, exempts all property owned by a water commission from property taxes. Public Act 100-0834 (SB 2274), sponsored by Sen. Jil Tracy and Rep. Norine K. Hammond, allows for the transfer of wooded acreage between spouses without disqualifying the property for a preferential assessment. Public Act 100-0869 (SB 2306), sponsored by Sen. Laura M. Murphy and Rep. Martin J. Moylan, prorates the homestead exemption for veterans with disabilities if they do not occupy their residence on January 1. Public Act 100-1077 (SB 3093), sponsored by Sen. Neil Anderson and Rep. Tony McCombie, clarifies how residents of life care facilities can receive homestead exemptions for property taxes. Public Act 100-0890 (SB 3215), sponsored by Sen. Jason A. Barickman and Rep. Lawrence Walsh, Jr., allows the county treasurer to request the certificate of purchase if the tax sale is declared a sale in error because the improvements to the property were destroyed. Public Act 100-0975 (SB 2539), sponsored by Sen. Scott M. Bennett and Rep. Barbara Flynn Currie, allows tax buyers to submit electronic receipts to the county clerk. Public Act 100-1070 (SB 585), sponsored by Sen. Jason Barickman and Rep. Lawrence Walsh, Jr., allows county treasurers to eject bidders that disrupt a tax sale auction or use illegal bid practices. The bill also states that the $10 automation fee applies for each subsequent year’s taxes paid by the purchaser. Public Act 100-1095 (SB 3085), sponsored by Sen. Chapin Rose and Rep. Brad Halbrook, allows a county treasurer to not publish delinquent or forfeited property taxes for subdivision common areas or properties that are exempt. Public Act 100-1104 (SB 1979), sponsored by Sen. Bill Cunningham and Rep. Robert Rita, increases the aggregate amount of property tax refunds for claims prior to 2009 that can be paid out each year from $2.5 million to $5 million. Public Act 100-1133 (HB 3418), sponsored by Rep. Sonya M. Harper and Sen. Mattie Hunter, allows municipalities to designate areas as urban agricultural zones. Taxing districts would then have the option to abate the property taxes for properties in these areas that are being used for agricultural purposes. Public Act 100-1120 (SB 2297), sponsored by Sen. Toi W. Hutchinson and Rep. Steven Reick, allows a rescue squad district to seek approval of a referendum to increase their tax levy. Public Act 100-0591 (HB 1910), sponsored by Rep. Dan Brady and Sen. William E. Brady, allows for a twelve-year extension for a tax increment financing district in Normal. Public Act 100-0609 (SB 424), sponsored by Sen. Andy Manar and Rep. Avery Bourne, allows for a twelve-year extension for a tax increment financing district in Litchfield. Public Act 100-0836 (SB 2303), sponsored by Sen. Dale Fowler and Rep. Dave Severin, allows for a twelve-year extension for a tax increment financing district in Marion. Public Act 100-0853 (HB 4536), sponsored by Rep. Fred Crespo and Sen. Cristina Castro, allows for a twelve-year extension for a tax increment financing district in Hanover Park. Public Act 100-0859 (HB 4853), sponsored by Rep. Jerry Lee Long and Sen. Sue Rezin, allows for a twelve-year extension for a tax increment financing district in Dalzell. Public Act 100-0873 (SB 2445), sponsored by Sen. William R. Haine and Rep. Katie Stuart, allows for a twelve-year extension for a tax increment financing district in Edwardsville and Granite City. Public Act 100-0899 (HB 4118), sponsored by Rep. Norrine K. Hammond and Sen. Jil Tracy, allows for a twelve-year extension for a tax increment financing district in Table Grove. Public Act 100-0928 (SB 2569), sponsored by Sen. Andy Manar and Rep. Sue Scherer, allows for a twelve-year extension for a tax increment financing district in Springfield. Public Act 100-0967 (SB 2304), sponsored by Sen. Jil Tracy and Rep. Randy E. Freese, allows for a twelve-year extension for a tax increment financing district in Monmouth. Public Act 100-1031 (HB 4129), sponsored by Rep. Katie Stuart and Sen. William R. Haine, allows for a twelve-year extension for a tax increment financing district in Posen and Caseyville. Public Act 100-1164 (SB 1415), sponsored by Sen. William R. Haine and Rep. Katie Stuart, allows for a twelve-year extension for tax increment financing districts in Hartford, Manlius, Hoopeston, Chicago, North Utica, LaSalle, and Country Club Hills. Allows a taxpayer to use an overpayment to offset future tax liabilities without filing a separate claim for credit for a number of different taxes. Corrects an inconsistency for required electronic payments for motor fuel taxes. Realigns the tax base for locally imposed sales taxes to that of the State sales tax. Over time, bills were passed that exempted items from the full rate and taxed them at the lower food and drug rate. These changes were frequently not made to exempt the items from locally imposed sales taxes even though they generally do not apply to food and medicine. Requires entities that file a federal 1099-K, Third-Party Payment Card and Third-Party Network Transactions return showing payments to an Illinois payee, to file the return with the Department. Allows the Department to transfer the proper income tax revenues to the Fund for the Advancement of Education and the Commitment to Human Services Fund each day rather than once a month. Exempts transactions from sales tax if they are exempt by operation of federal law. Currently, even though the purchaser is exempt, the retailer is still liable for the tax. Tax-free sales for resales of motor vehicles and tax-free sales for vehicles used as rolling stock can be filed on a single return each month, rather than a return for each sale. Clarifies that use tax is due on the day property is brought into the State for use, and the purchaser has 30 days to file a return. Removes a requirement that a notice of bulk sales is filed with the Department in Chicago. The notice still needs to be filed with the Department but is silent as to the location. Currently, if the Director of the Department of Revenue determines a disaster exists in Illinois or any other state, he can waive motor fuel licensing requirements. The bill expands this to cover disasters in any location. Lessors of motor vehicles that are leased to an interstate carrier, must pay the use tax when the property reverts to the lessor on the fair market value of the property at the time of the reversion. Public Act 100-0838 (SB 2667), sponsored by Sen. Elgie R. Sims, Jr. and Rep. Arthur Turner, creates a new criterion for future enterprise zones. Currently, for an area to be designated an enterprise zone, it must meet at least 3 of 10 criteria. This bill adds an eleventh criterion. An area meets the new criterion if the applicant demonstrates a substantial plan (i) for using the zone to encourage participation by businesses owned by minorities, women, and persons with disabilities or (ii) for the hiring of minorities, women, and persons with disabilities. Public Act 100-1032 (HB 4507), sponsored by Rep. Jehan Gordon-Booth and Sen. David Koehler, retroactively expands a sales tax exemption for businesses in enterprise zones. Under current law, a company must either create 200 jobs or retain 2,000 jobs in an enterprise zone to qualify. This bill allows a company between March of 2010 and July of 2012 to qualify if they previously qualified, and retained 200 jobs in 2009 and 2010, 675 jobs in 2011, 850 jobs in 2012, and 1,000 jobs in 2013. The bill also allows for a twelve-year extension for a tax increment financing district in Madison. Public Act 100-1149 (HB 156), sponsored by Rep. Steven Reick and Sen. Melinda Bush, expands one of the criteria for an enterprise zone to include inactive nuclear powered electrical generation facilities where spent nuclear fuel is stored on-site. Public Act 100-0721 (SB 2919), sponsored by Sen. Pamela J. Althoff and Rep. Michael J. Zalewski, changes the timing of the Unified Economic Development Budget from the Department of Revenue. With this bill, in 2019, the Department will report the tax expenditures from 2016 which are reported to the Department in tax returns filed in 2017. This ensures the Department has time to receive and process the tax returns ensuring the information is correct and final. Public Act 100-0722 (SB 2958), sponsored by Sen. Pamela Althoff and Rep. Robert Martwick, amends the State Tax Lien Registration Act. The bill requires that the lien filed by the State includes the county in which the real property is located. Public Act 100-1006 (HB 4724), sponsored by Rep. Natalie Phelps Finnie and Rep. Dale Fowler, does not require purchasers to obtain exemption certificates until high volume horizontal hydraulic fracturing permits are issued. 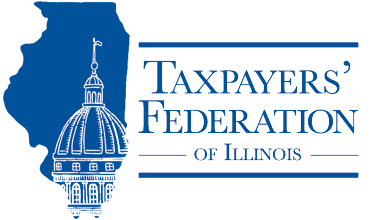 *Maurice Scholten, Legislative Director of the Taxpayers’ Federation of Illinois. Before joining TFI, Mr. Scholten was Senior Legal Counsel for the Senate President’s Office where he worked on taxes, pensions, workers’ compensation and unemployment insurance. Prior to that, he was at the Department of Revenue and worked at a property tax law firm while in law school. He received a Bachelor of Science in Mechanical Engineering from Iowa State University and a Juris Doctor from the Loyola University Chicago School of Law.